The seasons are turning and the snow is melting – it’s Spring in Battlerite! Eggs have appeared all over Talon Island and are just waiting for you to find them – so grab your basket! The Egg Basket is purchasable in the pre-game shop, replacing the Rock temporarily. These eggciting Spring treats can also be found scattered around the Island in over 200 different, secret locations. Make sure you keep an eye out and search through suspicious corners for them! There are nine eggcellent different kinds of Eggs that can be found in the Egg Basket – can you find them all? 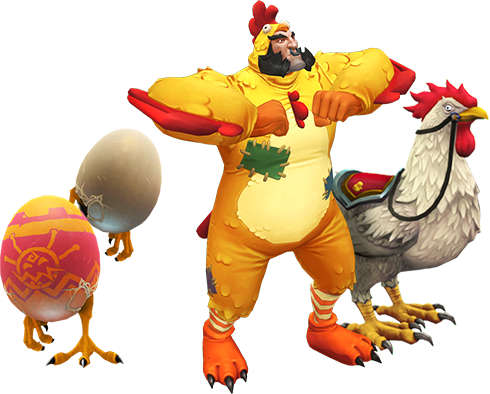 Chicken Suit Bakko and the Roosters from last year are back, and this time can be purchased individually with Tokens or Diamonds. The Chicken Suit Outfit and it’s color variations can be purchased for 500 Diamonds or 12,000 Tokens each, and the Golden Rooster and it’s color variations can be purchased for 650 Diamonds or 20,000 Tokens. If you’re eggcited to get clucking during Spring, the Chicken Emote is here for you! For a limited time the Chicken Emote is purchasable for 1400 Diamonds, unlocked on all Champions and complete with sound effects and music, so that you can out-dance and out-swag all your opponents. This bundle is available only until May 1st. Quest for new Egg Mounts in both Battlerite Arena and Battlerite Royale! Collect all of the limited-time mounts by completing Event Quests in both Battlerite and Battlerite Royale. 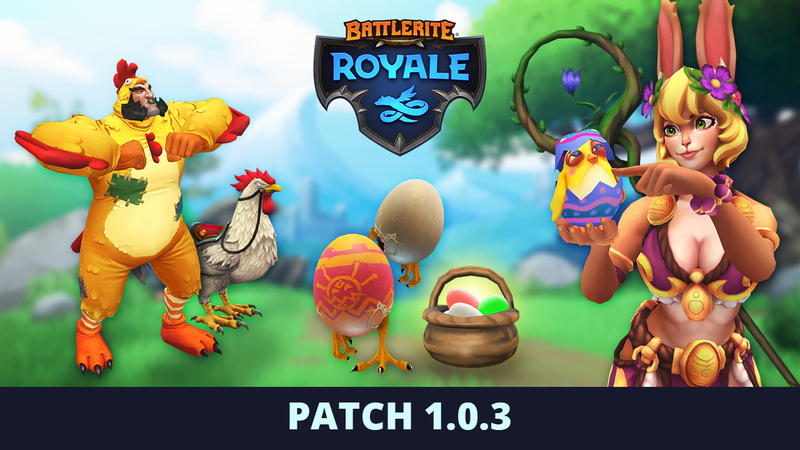 Check out the Battlerite Royale Patch Notes to see what eggs you can unlock there! Who makes the flowers bloom after winter? It’s the Bringer of Spring, of course! For a limited time, the Bringer of Spring Bundle is available to purchase for 400 Diamonds in game. This bundle contains the Bringer of Spring Legendary Outfit and Staff of Spring Epic Weapon for Blossom, and is purchasable until May 1st. A mysterious new bunny appears, available for a limited time at the low price of 750 Gems. This bundle will be revealed (and available) April 24th, and be purchasable until May 1st – but you might have a clue at who’s hopping in next! Fixed an alignment error where the name of an item dropped in a chest was overflowing the background. Fixed a bug where the “You have unsigned sponsors” prompt would be triggered when no sponsor were available. Fixed a bug where some cosmetic items that are currently unavailable was included in the Owned Items / Total Items count in various areas in the UI.